Cataracts can dramatically affect the quality of your vision by making it dark or cloudy. The condition can make it difficult to drive, read, or perform even minor daily tasks. Our team of eye surgeons can perform cataract surgery to replace your clouded lens with an advanced intraocular lens and restore clear vision. Cataracts cloud your vision so immediately after surgery, you should enjoy clearer vision due to the insertion of an IOL. Depending on your unique needs and the IOL you choose, cataract surgery may even reduce your dependency on contacts or glasses. Clear vision is essential for enjoying activities such as reading, hiking, or simply driving. Cataract surgery can improve your confidence and independence. Wondering how cataract surgery works? *According to the Nobel Vision Group. 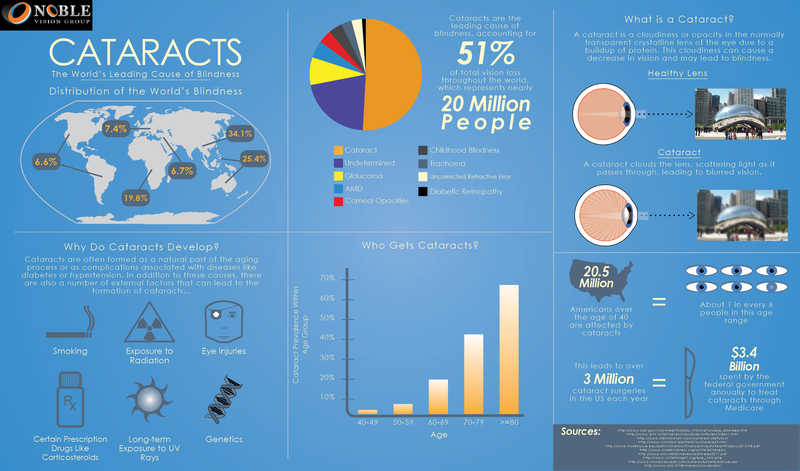 Cataracts are the leading cause of blindness for people worldwide. They affect approximately one in six people over the age of 40. Many insurance providers will only cover cataract surgery once it has significantly impaired your vision to the point where glasses do not help. As with any surgical procedure, candidates should be in good overall health. Be sure to discuss your entire medical history with our team. Ultimately, only an ophthalmologist can determine whether you are a good candidate for cataract surgery and whether it will meet your expectations. Worried about the Treatment's Safety? Although every procedure carries some degree of risk, cataract surgery is incredibly safe. According to the American Foundation for the Blind, 98 percent of cataract surgeries are successful and help patients achieve favorable outcomes. Cataracts can form at any age as a result of eye injury, medications, and disease or, in rare cases, they can be present at birth. Cataract surgery can be performed when the blurring caused by a cataract begins to interfere with activities that you need to do or enjoy doing. Until recently, most cataract patients had their vision improved with a single focus intraocular lens (IOL) which could only offer clear vision at a single distance. There are now advanced options that can reduce your dependence on glasses at a range of distances, such as reading and driving. A unique option is available for patients with astigmatism in addition to the presence of a cataract. If you have an astigmatism and are concerned primarily with improving your distance vision following cataract surgery, toric intraocular lense implants are a good option. The traditional, monofocal lens implant improves image quality and contrast after surgery. Patients without astigmatism generally achieve a decreased dependency on glasses for distance. However, glasses for near and possibly distance will be required following surgery with the traditional lens.